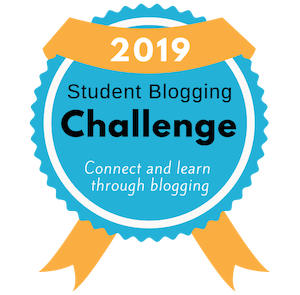 This is a guest post for the classes and students participating in the Student Blogging Challenge. If you have students who are not part of the challenge but would like to take part in this activity, they are very welcome! Welcome, students! My name is Mrs Morris. I am a primary school teacher in Geelong, Australia. I don’t have a class full time at the moment as I’m a stay-at-home mum to a 4 year old and 2.5 year old. I do a little relief teaching and also work with Edublogs to help teachers learn about the wonderful world of blogging. I really love helping students learn how to do these sorts of things safely, responsibly and purposefully. This is called digital citizenship. Just like you all aim to be a good citizen in your school and community, we need to aim for the same things when we are online: being kind, respectful, and doing things that make our lives and others’ lives better. Learning about digital citizenship is fun! I have created a choice of three activities for you to complete for this week’s challenge. I recently shared this poster with educators on my blog. 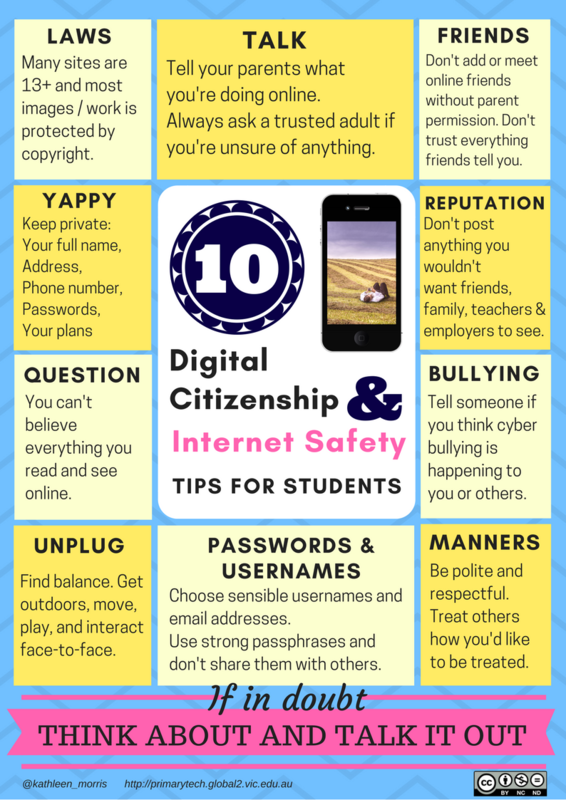 It offers ten tips for students about internet safety and digital citizenship. Take a look! Tip for Teachers: You can find more information about teaching students about digital citizenship on the original post. I also have a similar poster with tips for parents. 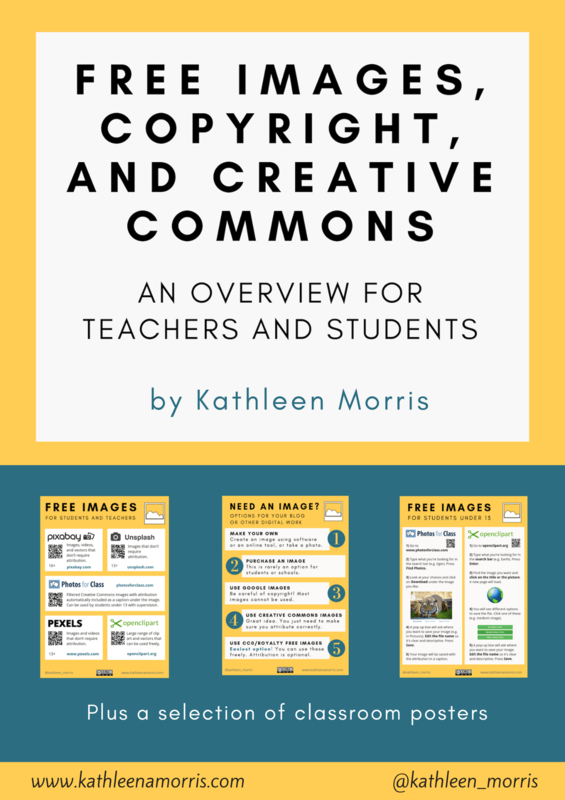 You are welcome to download a copy of this poster and put it on your blog or print it for your classroom. Choose one of the tips on this poster. Create a blog post for other students about this tip. Break it down and describe what it means to you. Offer your readers some ideas on how they can follow the advice. For example, you might choose the “unplug” tip. Tell your readers why this is important and how they can find balance in their lives. Offer some practical suggestions about how fellow students can unplug. You can describe some ways you do this yourself. You might even do a little bit of extra research to find out about this topic. Have you heard of YAPPY? This is an acronym to remind students of the personal information they should not share online. An acronym is where each letter in a word stands for a word or words. Do you like Garfield? Check out this Professor Garfield video about YAPPY if you have time/permission (it goes for about 4 minutes). If you can’t access YouTube at your school, you can find the video on the Infinite Learning Labs website (at the time of posting, this site is down for maintenance. Hopefully it will be back soon!). Demonstrate your understanding of YAPPY and share this useful acronym with others. Make a comic about YAPPY like my former students did. You can make comics with ToonDoo or Make Beliefs Comix. There are lots of sites online where we can watch videos, play games and complete different activities to learn about digital citizenship. This is an 11 question quiz narrated by Sam. It is suitable for children from approximately grade 2 to 7. Learn about making safer choices online through animated videos, short films, games, and interactive comics. This site is suitable for students from approximately grade 6 onwards. Have a browse and find a video, game or comic to try out. 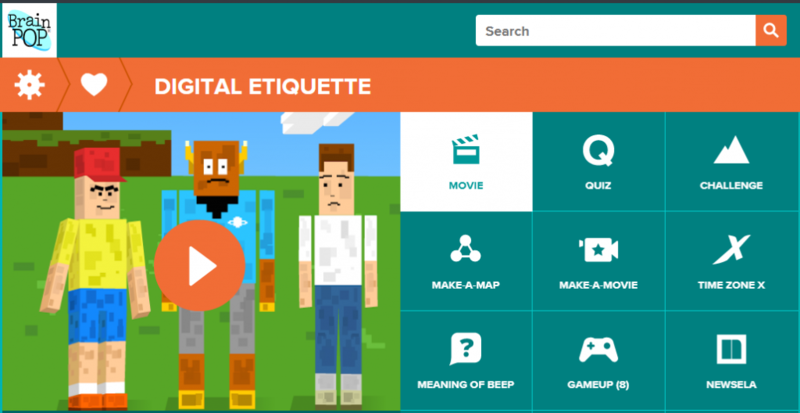 This is free BrainPOP resource to learn about online manners, courtesy, respect, the internet, and trolls. It’s suitable for students from about grade 4 or 5 onwards. 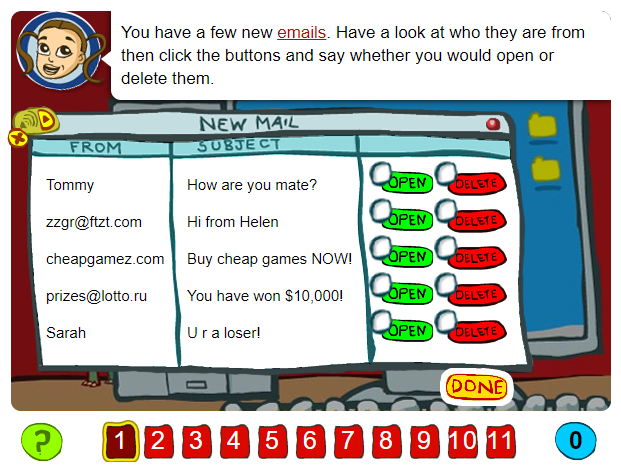 Watch the video with Tim and Moby (under 5 minutes) and then choose an activity to try such as the quiz or challenge. Once you have completed your choice of activity, please leave me a comment. If you publish a blog post, be sure to put the URL in your comment so I can check it out! If you have any questions about the activities, feel free to ask via a comment too. Scroll down to the bottom of this post where it says LEAVE A REPLY. Type your comment in the box (remember to make it a quality comment). Type in the anti-spam word. Write your name or nickname (optional: include your blog address and email address). If you do include your email address and want to know when I reply to you, tick the box that says “Notify me of followup comments via e-mail”. Note: If you do include your email address it will remain private. Have fun learning about digital citizenship. I can’t wait to see your wonderful work. Good luck! What is it like in Australia. I go to Gray Middle School in Kentucky. Hopefully you like your job. I love living in Australia! Our seasons are the opposite of yours so it is actually spring here. It is a lovely warm 34 degrees today. What has the weather been like in Kentucky? I do love teaching and helping teachers learn about blogging. I have completed my Week 6 – Visiting Others Post. I have chosen your post ‘Get Creative with Digital Citizenship’. I have made a video about ‘YAPPY’ using Biteable. Please check the following link for my blog post. Thanks for dropping by and leaving you link. I just left you a comment! I have completed my Week 6 – Visiting Others Post. I have chosen your post about ‘Digital Citizenship’. I have made a poster about ‘Cyber Safety – Tips For Students’ using ‘Canva’ application. Please check the following link for my blog post. I have completed my Week 6 – Visiting Others Post. I have chosen your post ’Digital Citizenship’. I have written about bullying. Please check the following link for my blog post.